Pixelache | Dutch E-Culture days at Pavilion, Helsinki, 21-22.7. News : Dutch E-Culture days at Pavilion, Helsinki, 21-22.7. Join Virtueel Platform on Saturday 21 and Sunday 22 July at the Pavilion of the World Design Capital in the center of Helsinki for two days of innovative showcases at the crossroads of digital media, arts and technology from the Netherlands. Their programme is divided into two themes: Transmedia and Social Cities. Transmedia is about telling stories in new ways, using multiple media platforms. In the Social Cities program we explore the ways in which we can shape our cities of tomorrow using digital media. Not to make them more hi-tech, but rather to make them more social. Entrance is free. Related Facebook event, and feel free to spread/tweet the word! Floris Kaayk is a visual artist / filmmaker. Floris will show his latest project, Human Birdwings (produced by Revolver Media), a transmedia story project about the mechanical engineer Jarno Smeets, who builds himself a set of wings to fly like a bird. Within his art projects he often fantasises about the future impact of this technological revolution. The Netherlands from Above is an ambitious transmedia project from Dutch broadcasting organisation VPRO. Various sources of data are used to tell the story of everyday life in the Netherlands. Jasper Koning, project manager at VPRO, will talk about (and show) the spectacular data visualisations and interactive online maps that were created for the project. Submarine Channel is an online channel that creates projects that explore the possibilities of new storytelling techniques, and researches the parameters of emerging genres. Creative director Remco Vlaanderen will zoom in on several recent projects, the motion comic The Art of Pho, and the video games made as part of the Split Second project. Saturday 17:00 – 19:00 Meet & Mingle with Dutch digital media producers, designers & artists. Are you working in the field of digital arts and culture? Interested in exploring opportunities or just curious to see what the Dutch digital arts & culture scene is currently up to? Please join us for drinks at this reception, and we will be glad to introduce you to the Dutch e-culture community. Drop us a line if you plan to come at bertan@virtueelplatform.nl. Since 2006, Submarine Channel has been curating some of the most impressive title sequences on what has grown into an internationally successful blog, interview series, screening series, and a DVD. This screening program features a one-hour selection of the very best title sequences made between 2005-2011. Fasten your seat-belt for a bumpy ride and, just this once, forget the film and watch the titles. You'll be glad you did! www.watchthetitles.com. Tonight they will show some of the most impressive and influential sequences that have been markers for contemporary visual culture as a whole. With an introduction by Remco Vlaanderen. There has been a lot of talk about smart cities recently, in which new media technology is said to make our cities more efficient. However, cities are much more than a bunch of infrastructure to be managed as economical as possible. How can we make use of new media to make our cities more social rather than just more hi-tech? Three Dutch (urban) designers will present their projects that aim to engage the public more deeply with their surroundings and bring urban public space to life. Kars Alfrink is the founder and principal designer of Hubbub, a networked design studio for applied pervasive games. He’ll talk about PLAY Pilots, a project commissioned by the city of Utrecht, the Netherlands, consisting of three live games produced for cultural festivals and one online game that ties them together. Michiel de Lange is a part-time lecturer New Media Studies at Utrecht University and co-founder of The Mobile City. In his talk he will present the ideas, methods and outcomes of two recently organised workshops in which digital media were used to strengthen citizen participation in solving real-world complex urban issues. Alper Çugun is a technologist and activist on the board of Hack de Overheid (‘Hack the Government’) with an interest in data and games. He will talk about the successes and future of application competitions such as Apps for Amsterdam, and how they greatly accelerated the release of open data and created public awareness. World Design Capital Helsinki Pavillion, Ullanlinnankatu 2-4 (between the Museum of Finnish Architecture and the Design Museum). Check the WDCH Pavillion website. Dutch E-culture Days is organised by Virtueel Platform, the Dutch institute for digital arts and culture from the Netherlands, in cooperation with Demos Helsinki (demos.fi) and with support from the Ministry of Foreign Affairs from The Netherlands. 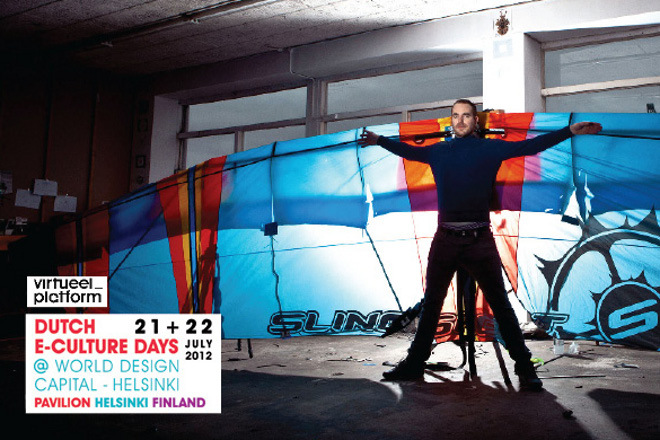 Dutch E-culture Days is part of the World Design Capital Helsinki 2012 Pavilion Programme. For more information about the program, or if you would like to get in touch with one of the participating parties, please --contactmartijn@virtueelplatform.nl.